Top chef Antony Worrall Thompson has used his expertise to carefully blend a range of meat rubs and sauces that will help quickly turn traditional barbecue food into sensationally seasoned sizzlers. All are packed in presentation sets with a variety of useful tools and dishes to give that professional touch. These rubs contain a unique coarse blend of whole and crushed dried herbs and spices to massage into and infuse with cuts of meat ready to sizzle on the barbecue. •	Perk up your pork with the colour and flavour of eastern spices including chilli, curry powder, coriander seed, paprika, clove, parsley, onions and garlic. All seasoned with salt and black pepper and finally sweetened with a little brown sugar. •	Create chirpy chicken with the sunny warmth of yellow mustard seed, green bell peppers, coriander seed, fennel seed, cumin, onions, salt and black peppercorns. These gently sweetened savoury sauces will help bring out the flavour of barbecued food. Just a few minutes’ marinating in either will give your barbecue more ‘bite’. •	Turn up the heat on your meat without more flame with AWT’s Barbecue Chilli Sauce. Fiery chilli is combined with sugar, water, garlic, salt and rice vinegar. •	Add a dash of traditional barbecue flavour with AWT’s Barbecue Sauce comprising sugar, soy bean, water, maltose, salt, soy sauce, wheat flour, garlic, modified corn starch, dried garlic spices, rice vinegar. 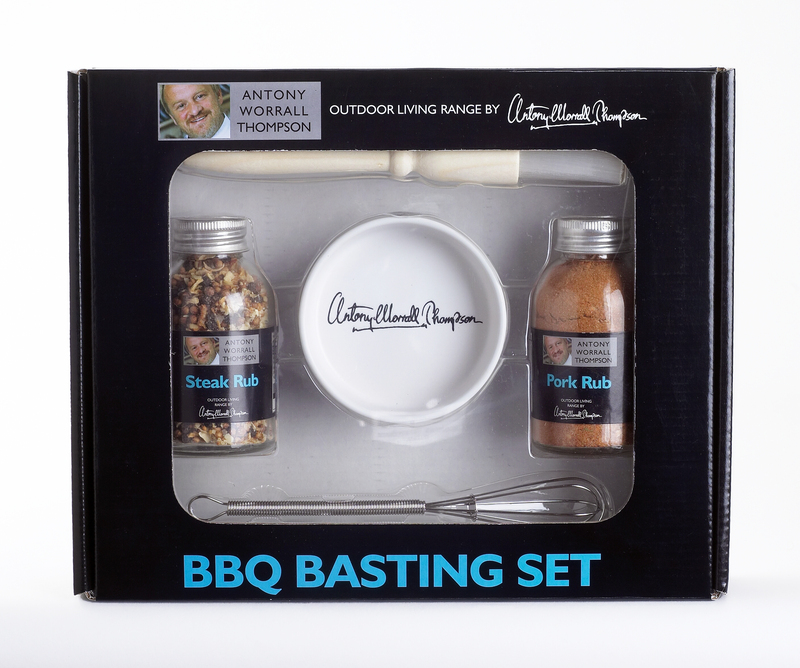 Antony Worrall Thompson barbecue food sets are available from Wyevale Garden Centres. The complete Antony Worrall Thompson range of barbecues and accessories can be bought from Wyevale Garden Centres. Selected barbecues and accessories are also sold by Argos, Next, Robert Dyas and Littlewoods Direct. For customer enquiries and stockists, call 0800 0281739. 1. Steak Rub: Black pepper corns, salt, garlic, onion, yellow mustard seed, ginger, coriander seed. 2. Pork Rub: Chilli, Curry Powder, Clove, Parley, Onion, Salt, Garlic, coriander Seed, Black pepper powder, paprika, monosodium Glutamate, brown sugar. 4. Barbecue Chilli Sauce: chilli, sugar, water, garlic, salt, rice vinegar, Xanthan Gum, potassium sorbate. 5. Barbecue Sauce: sugar, soy bean, water, maltose, salt, soy sauce, wheat flour, garlic, modified corn starch, dried garlic spices, rice vinegar, erythosine.